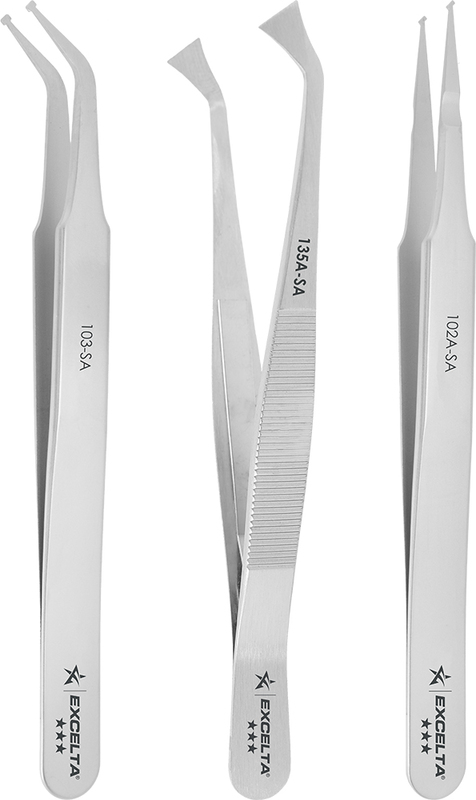 Paddle Tipped Tweezers hold rectangular devices very securely. 102A-SA has wider points for easy manipulation of most chips and miniature components. The anti-crush device has been added to reduce chip breakage. 103-SA has tips at a 45° angle. It is very useful for placing SOT-23 and SOT-89 packages. 104-SA has wide points to provide perfect control when manipulating and placing SOT-89 transistors and monolithic chip capacitors. 123-SA is used for smaller size SMD resistors and capacitors. Tweezer - ***- SMD Paddle - 4.5" SS/Anti-mag. Tweezer - ***- SMD Paddle - 4.25" SS/Anti-Mag.